Lindy Conant shares her experiences in leading worship in countries all over the world, and encourages us to serve the people we are leading and cultivate a surrendered heart to the Lord. 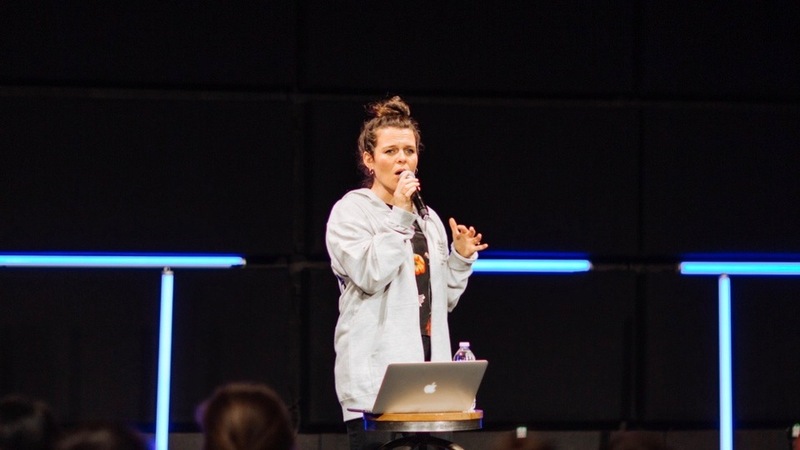 When Lindy was reading the Great Commission (Matthew 28:16-20) for the first time she said, “If this is what Jesus left us with, then what are we doing?” She started going on mission trips in high school, and in the midst of people’s suffering and brokenness, she was falling in love with God. The term musicianary means is a musician and worship leader who wants to give it all for God and do whatever God asks. The angel Gabriel says to Mary the mother of Jesus, that she will carry the Messiah, she rises from that place and says “Behold, I am the servant of the Lord; let it be to me according to your word.” (Luke 1:38) When Lindy first read that scripture she said “Put that in me God.” So that when something seemed so far out of reach and culturally wrong and embarrassing, that would be her response. Sometimes musicians and worship leaders have the mindset of being excused from what God is doing in the room. There’s this assignment from the enemy on worship leaders that make them think that their exempt from being all in with Jesus. As worship leaders we need to drown ourselves in the Word. The enemy tries to keep us out of our spiritual disciplines and use the “creative” excuse. Are you in the Word? Are you worshipping Jesus on your own time? Do you have a prayer life? Are you actively sharing your faith? When you share your faith, keep it simple. When Lindy started leading worship in Kona, there were more Koreans in the audience than English speaking people. So she and the other Korean worship leader would switch leading every week. The Lord spoke to Lindy and told her to do bilingual worship, where Lindy would learn to sing things in Korean. When people can learn how to do that , it’s almost like you’re touching heaven, because heaven includes every nation, tongue and tribe. Sometimes it’s not an actual language change, but it’s praying and asking God, what will translate the language of Jesus to these people? Worshipping in the nations will change your life. It’s beautiful when you get to see the different expressions of culture and what God is doing on the earth, because it expands your heart. There are really great worship movements that are happening all over the world, but what if we went down the road that’s not been paved, where we can take an acoustic guitar and lift high the name of Jesus? Dont ever undermine what God wants to do through your music and your worship. It’s to bring glory to Him but also about helping people see Jesus and see the gift of salvation pour out through your music. What is the Lord really speaking to you right now? Vulnerability. I burn with wanting to see souls saved and that comes out in the songs I write. But what the Lord is teaching me right now is that there is a journey that got me to that place-10 years of singing love songs to Jesus. And God is bringing that back to the forefront of being able to be vulnerable with my love for God and how that translates into love for people and love for the lost. To be unashamed of letting people see those deep emotions with God. The place of loving on Jesus and seeking Jesus and letting Him love you is the only place you can gain a passion for souls. How can we take worship to the next step? The biggest thing is pressing in. Your own secret place with God is what translates the most. That’s why two people can sing the same song and there’s a totally different outcome in the room. Press into Jesus and ignite your secret place. A great place to start is by reading the Gospels.